Presenting 11 Ironbark Circuit, Everton Hills. Positioned in a quiet enclave of contemporary properties, number 11 presents the perfect opportunity to secure a stylish residence in desirable Everton Hills. Completed in 2007 and being sold for the first time by its original owner, the home cleverly incorporates multiple living areas over a relaxed, single level. At the heart of the home is a generous open plan kitchen, lounge and dining leading out to a fantastic covered outdoor area - the perfect spot for entertaining or to sit and unwind. 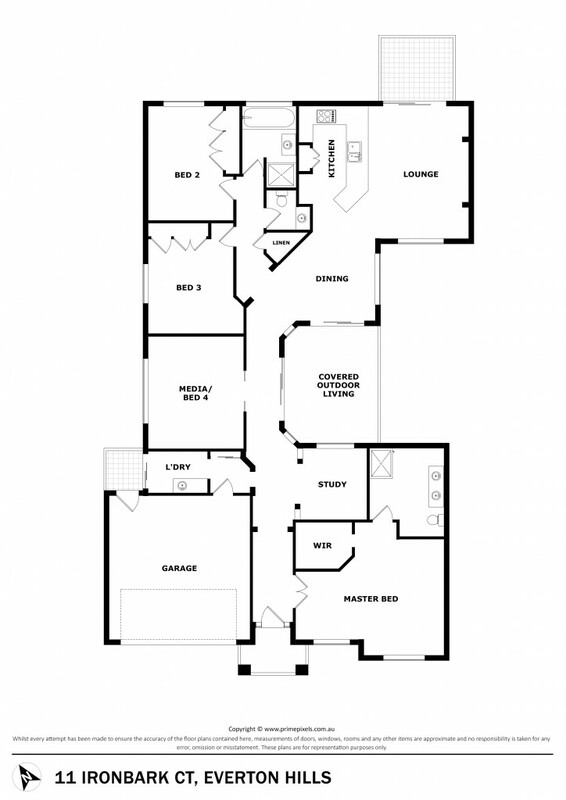 The well thought out floor plan provides for an oversized master suite positioned away from the main living areas, as well as a dedicated study and large central media room (or perfect fourth bedroom or second lounge). Resting on a prime, landscaped 600m2 parcel of land and with nothing left to except move in and enjoy, this home is a must to inspect. Conveniently located in Everton Hills - approximately 12km north-west of Brisbane's CBD - with easy access to a selection of recreation, schooling, shopping and entertaining options.